The primary purpose of LID (Low Impact Development) is to prevent harm to streams, lakes, wetlands, and other natural aquatic systems from nonpoint source pollution. LID is typically applied at the parcel and subdivision scale and emphasizes conservation and use of on-site natural features integrated with engineered, small-scale hydrologic controls to more closely mimic pre-development hydrology. Ideally, LID is a component of a community’s development ordinances and is applied throughout a watershed. 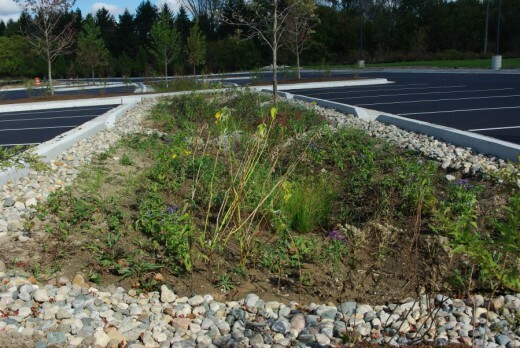 This is a completely different approach than conventional stormwater management, which treats stormwater as a by-product for disposal using costly end-of-pipe technologies. LID techniques address precipitation first as a water resource. Many of the LID techniques focus on capturing stormwater for irrigation use on a site (retention or detention). This not only supports landscaping, but helps recharge groundwater. Other techniques slow and filter stormwater so that when it enters a stream or river, it does not carry with it the high concentrations of urban pollution that degrade the river or lake’s water quality. 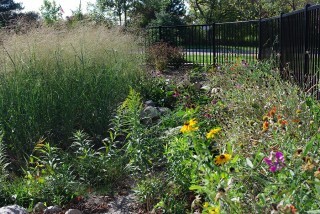 LID Integrated Management Practices (IMPs) are often small, cost-effective landscape features located at the lot level. IMPs can be developed using open space, rooftops, streetscapes, parking lots, sidewalks, and medians. They can be applied equally well to new development, urban retrofits, and redevelopment / revitalization projects. The most common IMPs you may be familiar with are rainwater harvesting (rain barrels and cisterns), bioretention (bioswales and rain gardens), permeable pavement, green roofs, green parking lots, and streamside buffers. 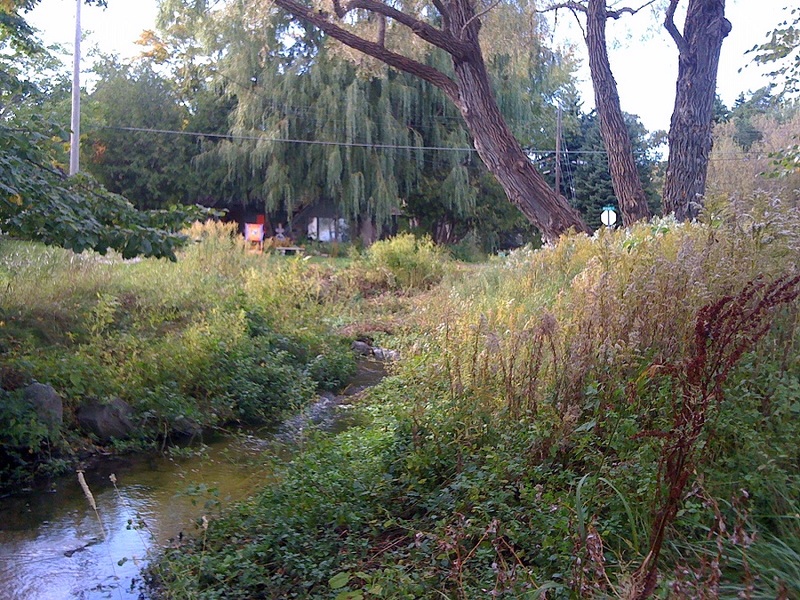 A streamside buffer of undisturbed native vegetation helps to slow the flow of stormwater, as well as remove nonpoint source pollutants that degrade streams, rivers, and lakes. 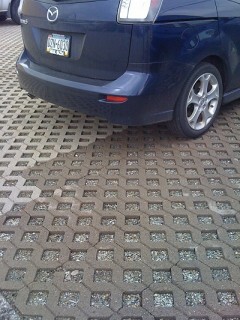 Permeable paving allows water to infiltrate a parking lot rather than run off. 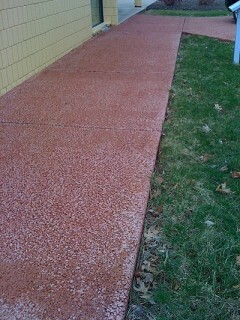 A granular base helps to filter pollutants such as grease and oil. This surface performs well for passenger vehicle uses (but not heavy trucks) and stands up to frequent snow removal in winter. Porous concrete looks very much like regular concrete, but allows almost 100 percent of the water that falls on it to pass through. In addition to capturing stormwater, a green roof reduces the building’s power consumption because it keeps the roof cooler and provides excellent insulation. 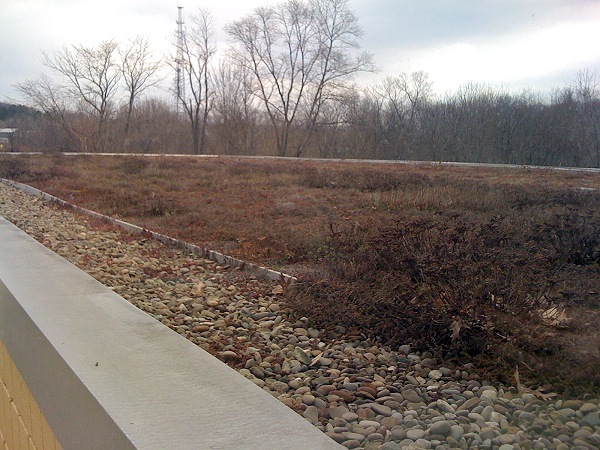 In this photo of a green roof taken in late winter, note the combination of filter medium (small pebbles) as well as plants. Editor's Note: take a look at the largest green roof in the world (at 450,000 square feet, in this report I filed, When Rouge Turned Green. 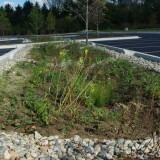 The bioswale shown below absorbs stormwater runoff from the adjacent parking lot. Note the curb cuts on the right that allow stormwater to flow into the bioswale. 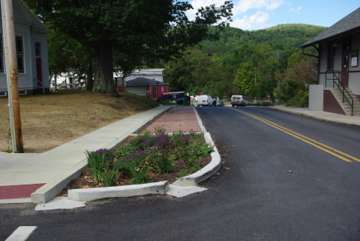 This “green street” in Ohiopyle, Pennsylvania (seen on the right) includes bioswales and permeable paving. Rain gardens mimic the natural system to reduce stormwater runoff. In the photo below, stormwater used to flow from the adjacent building’s roof to the downspout to the combined sewer. Editor's Note: see also these two videos on constructing rain gardens. You may be tempted to lift the practices we just highlighted in their generic form and apply them to your location. We don’t recommend this, because you may not be selecting the most applicable Integrated Management Practices for your specific watershed conditions. For example, LID practices must be sized and applied differently in Michigan, Florida, and Arizona because the climate and hydrology of these locations are very different. When it comes to LID, one size does NOT fit all. LID is also not a solution for dealing with floodwaters from catastrophic storms. No single system, LID or traditional, can be affordably built or operated to withstand extreme events. The most flood-resilient communities will have a combination of LID and traditional gray infrastructure, both carefully planned and located to work in combination to address the community’s and the watershed’s hydrology. LID techniques generally work best for precipitation events that do not exceed 1.5 inches in 24 hours. In most localities, this volume of precipitation characterizes 75 percent or more of the annual rainfall, making LID highly effective at capturing and managing the flow from most rainfall events. We recommend that your first step in developing LID standards for your community is getting technical assistance in conducting a watershed analysis, a water budget and hydrographs for your watershed. These data will then be the basis for your LID program. In addition to helping ensure the appropriate IMPs, these detailed hydrologic studies will help to measure the benefits of Low Impact Development and document your community’s LID success. In our next installment, we will examine the costs and benefits of LID according to U.S. case studies. 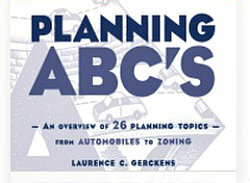 For access to the Segedys' other articles for the PlannersWeb and Planning Commissioners Journal. Stormwater runoff: water from any kind of precipitation event (rain, snow, or ice) that flows or drains off of a given property. Watershed: the area of land where all of the water that is under it or drains off of it goes to the same place. See illustration on right. 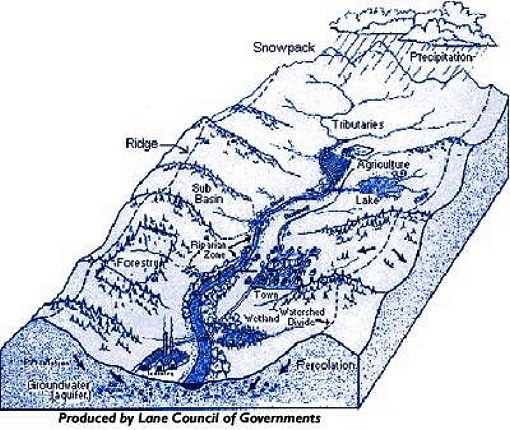 Hydrology: the properties, distribution, circulation, movement, and effects of water, especially in relation to land. Pre-development hydrology: hydrology of a site as it existed prior to its conversion from its naturally-vegetated, undeveloped conditions to any type of built environment. Nonpoint source pollution: Unlike pollution from industrial and sewage treatment plants, nonpoint source pollution comes from many diffuse sources. It is caused by rainfall or snowmelt moving over and through the ground. Watershed analysis: a comprehensive overview of key physical conditions and trends in the watershed, including but not limited to land uses; slope and topography; conditions of streambanks, wetlands, and floodplains; percent impervious cover; flood stages; water quality; and other criteria. Water budget: a mathematical analysis of the flow of water in and out of a system over time. Hydrograph: a graphic representation of the volume and timing of rainfall runoff at a particular location in a watershed.